So the boy and I have not been doing a ton of "cooking". It is summer and the feelin is easy! So we have been making a lot of just fresh garden green salads and a lot of pasta salads. Sometimes a sandwich here or there, but we have not been fussing in the kitchen too much and if I do find something new to try, it is on the grill. So with that being said, here is a great grilled chicken salad, another BH&G recipe! 1. Heat indoor electric grill or grill pan over medium heat. In a bowl combine chicken and onions. Toss with 2 tablespoons of the olive oil, rosemary, and 1�4 teaspoon each pepper and salt. Grill chicken and onions on grill rack or in grill pan for 10 minutes, or until chicken is no longer pink, internal temperature reaches 170 degrees F, and onions are tender, turning once. 2. Meanwhile, for dressing, in a saucepan combine juice; vinegar; and remaining olive oil, pepper, and salt. Bring juice mixture just to boiling; remove from heat. 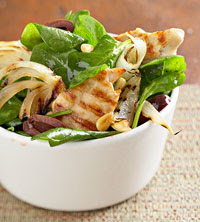 Place spinach, olives, pine nuts, chicken, and onions in an extra-large salad bowl; toss to combine. Pour warm dressing over salad mixture. Toss lightly. Cover salad with a large plate for 1 to 2 minutes or just until spinach is wilted. Remove plate. Serve immediately. Makes 6 servings. * About Kalamata Olives: Kalamata olives are a variety of Greek olives with a rich fruity flavor. They are a dark purple color, almond shaped and about 1/2 to 1-inch long. 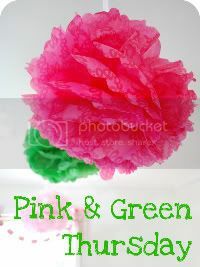 They are available in the grocery store packed in jars of oil or brine, or sometimes can be found at the deli counter. ** Test Kitchen Tip: To toast nuts, spread the pine nuts or slivered almonds in a single layer in a shallow baking pan. Bake in a 350�F oven for 5 to 10 minutes or until light golden brown, watching carefully and stirring once or twice so the nuts don't burn. You can toast the nuts up to a day ahead, if desired. yum, yum, yum! Rosemary and pomegranate, how much better can a salad get? Yummy! Will definitely try this! I love toasted pine nuts in salads.